We are situated in The Wick Country Park, The Wick Pavillion and are open 51 weeks of the year, Monday to Friday 7am - 6pm. The also accept childcare vouchers..
Below are the latest reviews for PlayDays Nursery. Please note that reviews represent the subjective opinions of other Childcare.co.uk users and not of Childcare.co.uk. Parents must carry out their own checks and references on childcare providers to ensure that they are completely happy before enaging in the use of their services. 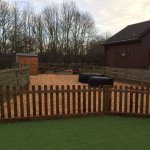 Playdays is an excellent nursery in Wickford. My little charm started attending when he was 1.5 yrs and was very well cared, loved and played. He is a fussy eater but still they managed very well with his feeding and working along side me .. very very supportive staff and clare is awesome ,always friendly and helpful in need. It's the small things that make a HUGE difference! They have been taking care of our son for almost a year now and we are truly thrilled by the kind, considerate way in which our son is cared for. One thing I appreciated the most was that Clare and Ian planned activities tailored to my son's needs which really helped with his development. In the months building up to him starting school they also made sure he was familiar with the route to school, the morning routine and even made sure he was confident carrying his own bags to school.....it's all the little things that make such a HUGE difference. My husband and I always appreciate the texts and messages as well as the new newsletters that keep us up to date with new activities, policies etc. Moving to the new site has been incredible for the older children (breakfast and after school clubs) and the facilities are outstanding. Above all else my son feels safe, cared for and loved. What else could we ask for? I don't think we thank you all enough for your hard work. You truly are all amazing! My children have been coming to Clare since the beginning of 2014. We made the descion of looking for childcare when i decided to go back to work and i was very scared i would never find the 'right' people to look after my children. The moment I met Clare and her staff i feel completely at ease anf welcomed and I knew i had made the right choice. All staff and the children within Clares care are lovely, very friendly and well mannered. My husband says it is a home from home for our children who always come home happy and can not wait to see them after a day off. Clare and her staff get to know all the children on a one to one basis and they now know exactly what my children do and do not like. Home cooked meals and text updates are all fantastic. Well done Clare, you are great! I would recommend to anyone who wants friendly, loving and caring childcare for their children. I had been sending my boys to Clare since 2012 until recenlty when our contract for childcare was terminated without full notice. The reasosns given for this terminatiion do not ring true with myself and my husband, and we feel that after taking on several staff, who seem to just appear that Clare has taken on to much. This used to be a friendly run childminding service and is now more a busy hetic business. In response to joannecox poor review that was noted about myself. Parents, please note that due to our strict behaviour policies, we had no alternative but to terminate the boys contract. BOTH parents were notified of incidents that occurred, on one or more occasions. We have been looking after the boys as stated above since 2012, and they were very happy and enjoyed every minute being in our care, and treated like one of our own. We found ourselves in a very difficult situation in having to terminate the contracts, but had to make the right decision that we felt best. It was unfortunate that the relationship then has broken down, since terminating contract under the circumstances. We all feel let down by the parents comments. We would like to wish the boys and family all the best for the future. Clare has been caring for our little man Jack since he was 5 months old and it was the best thing we could have done. Financial needs pushed me back to work earlier than I would have liked and before my husband and I found Clare I was struggling with the idea of leaving my little man with anyone. The day we met Clare and Ian a huge weight was lifted from our shoulders as they were warm, welcoming and made our Jack smile the minute he met them. I get daily updates within Jacks contact folder and when home get to see for myself exactly what he has achieved. I also get pictures and texts throughout the day so I feel like I am involved in Jacks routine. Leaving Jack with Clare and the family is truly like a home from home for our little boy, I could not have asked for anymore and can 100% recommend Clare to any parent that needs a childminder.